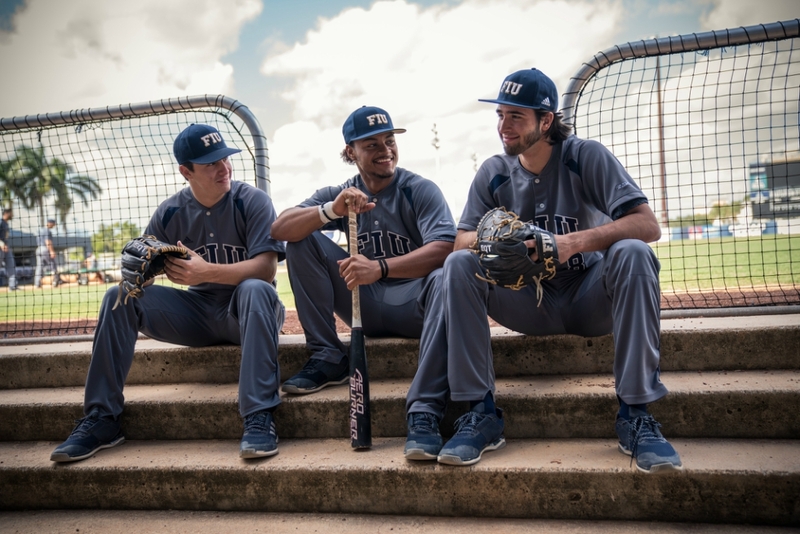 Pictured above: Freshmen (left to right) Logan Allen, Jose Garcia and Christian Santana were drafted by MLB teams last year but opted to pursue degrees and help build a powerhouse baseball program at FIU. The first day of the 2017 Major League Baseball Draft came and went. So did the second. By the third day, recent high school graduate Christian Santana had almost stopped paying attention altogether. The hard-throwing right-handed pitcher and FIU recruit had expected to get an offer from one of 30 MLB teams in the early rounds of the draft. It became apparent that wasn’t going to be the case. But then a friend called to congratulate him, and Santana ran to his computer to confirm the big news: the Milwaukee Brewers drafted him in the 15th round. Santana was one of 14 recruits in FIU Head Coach Mervyl Melendez’s 2017 recruiting class – the No. 1 recruiting class in the country – who were drafted. Each recruit had to make the decision hundreds of ballplayers make each year right out of high school: go to college or go the professional route. For Melendez, now in his second season at FIU, it was no surprise that many of the players he recruited in his first class were going to be swooped up before stepping onto a college campus. One of those recruits was his son, MJ, who was picked by the Kansas City Royals in the second round during the first day of the draft, adding a new wrinkle to the process. For most players and their families, the decision comes down to how much the team offers them to sign. Outfielder Heliot Ramos was the highest Panther recruit drafted, taken by the San Francisco Giants with the No. 19 overall pick and signing a $3.1 million deal. MJ Melendez, a 6-foot-1, 175-pound catcher, opted to sign with the Royals for $2.1 million days after he was drafted. In the end, 10 of the Panther recruits decided to sign with the teams that drafted them. For several of the Panther recruits drafted, the numbers did not add up. Four of the draftees elected to go the college route, including Santana, left-handed pitchers Logan Allen (16th round, Baltimore Orioles) and Joe Sanchez (39th round, Atlanta Braves) and catcher Jose Garcia (38th round, Boston Red Sox). With guidance from their parents and coaches, they weighed the pros and cons of both options and decided that spending a few years at FIU under Melendez and growing as baseball players was the wisest choice. The chance not only to develop at the college level, but to pursue a degree as well played a role in their decision. Santana is studying sports management with the hope of one day becoming a physical therapist after he is done with baseball. While they put their professional dreams on hold, they will have a chance to continue building on what Melendez is doing at FIU. He was a key reason they signed on to become Panthers. While fans coming out to FIU’s newly named Infinity Insurance Park early in the 2018 season likely didn’t recognize many of the names on this year’s roster – with 14 incoming freshmen and five transfers, half the team wasn’t here a year ago – the Panthers promise to be a young team loaded with talent from the pitching staff to the outfield. Garcia has shared catching duties with sophomore Javier Valdes and is among the offensive leaders for the Panthers in home runs and RBIs. Allen leads the team in wins and has become one of the top starting pitchers as the Friday starter. Allen has also played first base and hit near the top of the lineup. Santana has started and relieved. The right-hander has a save and has one of the best strikeout rates per nine innings on the pitching staff.